Bathhouse Article Causes Reader Backlash. Toronto’s Gay BiWeekly, xtra Toronto, had recently published an article about a Bathhouse Shrink. 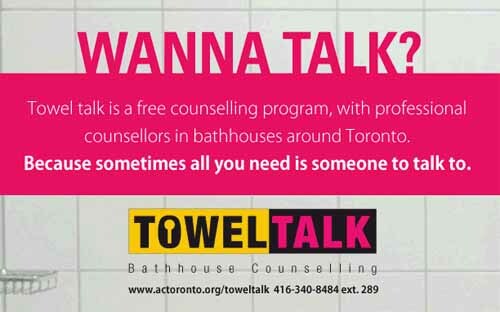 Along with the AIDS Committee of Toronto (ACT), Marco Posadas runs a program, called Towel Talk. It’s other goal is to raise awareness and reduce HIV and STI transmissions. Now you would think this program and Marco Posadas would be praised by the gay community. But just the opposite. Once the article appeared in xtra Toronto, several readers posted comments rather negative about the program. Some even call it ‘self-serving’ of Marco Posadas, questioning his credentials as a therapist/counselor. Judge for yourself by reading the article and comments of Bathhouse shrink faces honour and prejudice in home country.